Pesticides and herbicides are designed to be toxic to pests and can harm birds, fish, pets and humans if misused. If lawn chemicals, pesticides or herbicides are used in larger doses than recommended on the label, runoff can have an adverse effect on drinking water supplies and the environment. Avoid buying more product than you need, as it is likely to become waste at a later date. Store pesticides in original containers that are closed and labeled, in a secure area out of reach of children and pets. Avoid storing pesticides in damp areas where containers may become moist or rusty. Pesticides should NOT be stored near food. Follow label instructions strictly about where and how much to apply. Do NOT put pesticides in the trash or down the drain. Use rubber gloves when handling pesticides and use an appropriate cartridge mask if using products extensively. Do NOT use or give away banned pesticides or pesticides that are no longer registered for use. EPA maintains a list of over 50 banned pesticides Click here for the list. 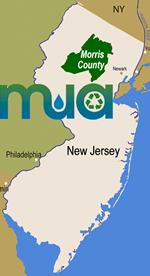 To find out whether a product is no longer registered for use in New Jersey, contact the NJDEP. For questions on specific pesticides and environmentally friendly products and procedures, such as Integrated Pest Management, call the New Jersey Pesticide Bureau at 609-530-4070. For more information on identifying pesticides, their health hazards, and use and Management guidelines, call the National Pesticide Telecommunication Network at (800) 858-7378. If the pesticide is banned or no longer registered for use, save in original container for the next household hazardous waste collection day. If the product is still registered for use, use up according to directions on the label or donate it to a friend or neighbor who can use it. If you no longer have a use for the product and are not able to give it away, save it for a HHW collection day or take to a commercial hazardous waste facility. Do NOT recycle or reuse pesticide containers. Fill the empty pesticide container with cold water and use the rinse water as if it were full-strength product, in accordance with the label instructions. Do NOT pour rinse water down the drain. Once the container is empty and triple rinsed, it should be wrapped in newspaper and disposed of in the trash. Do NOT triple rinse containers for banned or unregistered pesticides. Save these for the next household hazardous waste collection day.